Our Easter section is now open, and stocked with personalised party bags and boxes, featuring our lovely new designs - Easter Chick and Easter Bunny! Choose from a party box, recycled paper bag or printed cotton bag. 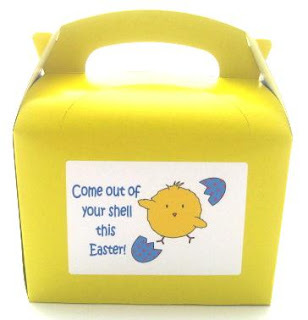 Each item can be personalised with your message and/or names, so they make perfect Easter gift bags and boxes, and are ideal for Easter Egg hunts! See them all in our Easter Party Section.